There’s an increasing amount of attention being paid by tech companies to how data is used in K-12 education. More and more start-ups (as well as larger companies, including the education publishers) are focusing on how to capture and make use of student, school, and district data to drive academic gains — e.g. capturing student performance in real-time to enable teachers to provide personalized learning, differentiated instruction, etc. I was curious about what kind of publicly available K-12 data exists today, so I headed over to the National Center for Education Statistics (which is run by the US Dept of Ed) to see what they have. What I found was mostly a collection of macro-level, dated info (some of the most recent data is from 2010). More useful for policy makers than for students and teachers. But what’s clear from the data is that while K-12 market is massive, it’s extremely fragmented — and it’s why the emerging tech companies will face distribution challenges unlike in any other tech market. 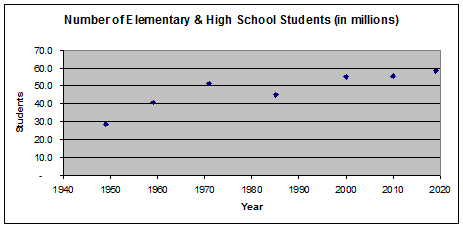 The growth of the US elementary and high school population has almost doubled in the last 60 years to 56 million. Interestingly, much of that growth occurred from 1950-1970 with the baby boom explosion, and for the last decade, the population has remained essentially flat. By 2019, the US DOE predicts there will be an additional 3 million K-12 students or about 60 million.